This grand residence is enrobed by open city, river, and sky views in three directions - offering rare residential space with two private, screened-in balconies, and a magnificently livable and gracious layout that makes life easy, refined and fun. Here is the home that would likely cost you four times as much in minutes-away Manhattan. The crowning jewel of its beloved mid-century building, this luxury 4-bedroom, 4-bath head-turner is a residential find offering you a lifestyle unsurpassed in today's market: a suburban-scaled, urban-minded, smartly renovated, grand house-in-the sky (with central ac) offers lateral, full service living in a location which comes with many conveniences and an easy-to-get-to address. An entertainer's dream home, this easy-to-live in and easy-to-love residence gives you a big, elegant east-facing living room with east balcony access, a decorative mantle (and the ability to add a wet bar) - all overlooking the Harlem River and Columbia University's Baker Field. With a private office and oversized windows, this "sunrise" side of this happy home shines brightly. The "sunset" side of this fresh and welcoming residence brings you an oversized dining room with west-balcony access, a custom, walk-in pantry (with bonus fridge), and an enviable, double-scaled, eat-in Chef's kitchen boasting stone counters, a 6-burner stove by Thermador, a super-sized refrigerator and freezer (also by Thermador), dual sinks, a wine fridge and a breakfast nook. Dramatic skies and dinner parties reign supreme with western views of the Hudson River and the Palisades. Both corner master bedroom suites have dual exposures (cross breezes anyone? 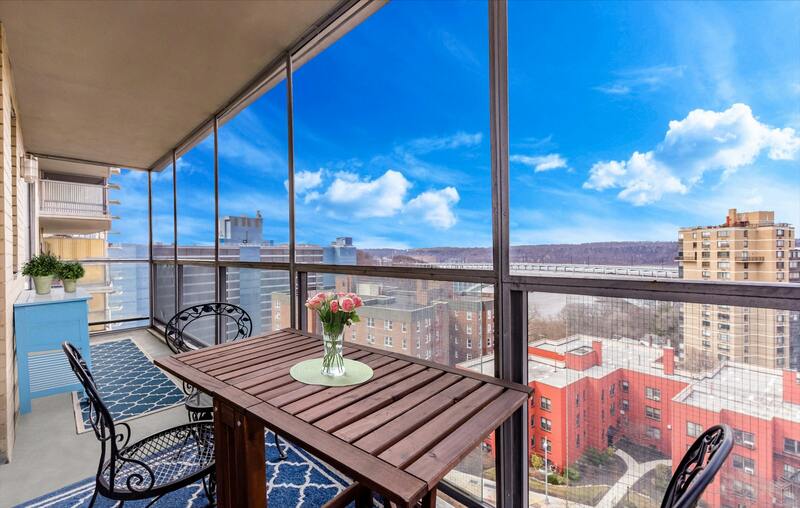 ), expansive city views, and enjoy their own private balcony access: one faces east (sunrises over the Harlem River and playing fields) and one faces west (sunsets over the Hudson River and Palisades). Both master bedrooms are well-scaled, peaceful, bright, and offer designer, outfitted walk-in closets and en suite marble baths. Two additional, large bedrooms offer outfitted closets, boast, expansive city views, and are served by their own respective full marble baths. With a formidable foyer/gallery hall, new plumbing and electric, hardwood floors, walk-in closets, crown and floor moldings, and pocket and custom doors, this unforgettable home stands out for all the right reasons. Perfectly perched in the full service, pet-friendly, porte-cochered Winston Churchill, this luxe residence enjoys prime access to the building's indoor pool, new gym, playroom, playground, party room, game room, lounge, saunas, building garage, full time doorman, and resident superintendent. Ideally situated near the Metro North train station, express and local buses, and close to all area dining and shopping destinations, this big, beautiful home is 22 minutes by train to Grand Central Station, and 10 minutes by car to Fairway's uptown market. Elegance, space, views, light, and a remarkable value-proposition to neighboring Manhattan rarely converge like this. Right here - right now -- your sprawling, renovated, house-in-the-sky awaits you.